Made by Tom, William in Orange, New South Wales, 1851. Washing cradle consisting of a wooden, sled-shaped base on rockers and a wooden washing tray with a perforated base. The base, made of cedar and iron, comprises a flat base with two rockers underneath. Three sides are enclosed and slope up to a higher point at the back (on which the washing tray rests). A crudely shaped wooden handle extends up vertically from one side. The gold washing tray is square in shape and has a base consisting of a single sheet of metal perforated with rows of holes. In white paint on both "523" [RAHS No.]. On tray white paper stick on label printed in black "4"
Edward Hargraves (1816-1891) is credited as the first person to find gold in Australia. In fact, Aborigines were well aware that a shiny gold mineral could be found along rivers and in rocks and the first European mention of gold being present is as early as 1823 (by James McBrien). The real contribution that Hargraves made was in the introduction of Californian mining methods, particularly the cradle. Easy to make and thus accessible to all, cradles made it possible for anyone to prospect for gold. William Tom, (1791-1883) was farmer and Methodist leader who came to Australia from Cornwall in 1823. He settled in the Orange area and established a property called 'Springfield'. In 1851, Edward Hargraves visited 'Springfield' and explained to William Tom's sons how to build a cradle, and William Tom Jr (1823-1904), with his brothers James and Henry worked along the creek, eventually washing sixteen grains of gold in one day. Soon afterwards William Tom Jr and John H A Lister found nuggets totalling four ounces and wrote to Hargraves who hastened back to the field, and named it Ophir. The gold rush followed. William Tom Jr with his brother James, testified to the Select Committee 1890 on the discovery of gold. Lister died during the proceedings. William Tom met Edward Hargraves in February 1851 and made the cradle shortly afterwards. 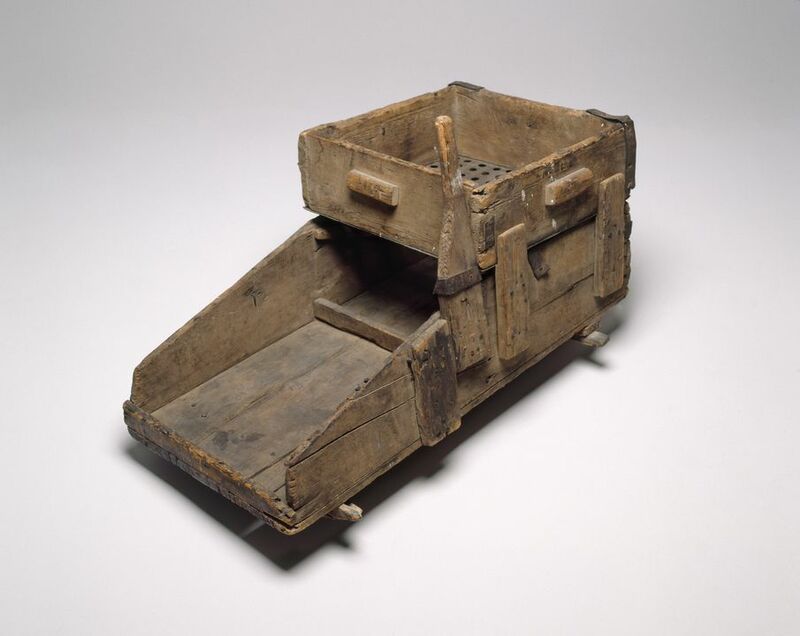 This cradle was used by William Tom (1823-1904] and his brothers, James and Henry, to prospect for gold in the Orange area (later known as Ophir). Once their discoveries were published in the Sydney Morning Herald, thousands of diggers rushed to the area and the Australian gold rushes began. It appears that this cradle remained in the Tom family until it was donated to the Royal Australian Historical Society. It was subsequently acquired by the Museum as part of the Royal Australian Historical Society Collection in 1981 (RAHS #523).